An inside look at USC's global health activities. Panama is home to the Embara, Guna Yala, Ng?be-Bugl?, Kuna de Madugand? and the Kuna de Wargand? communities. 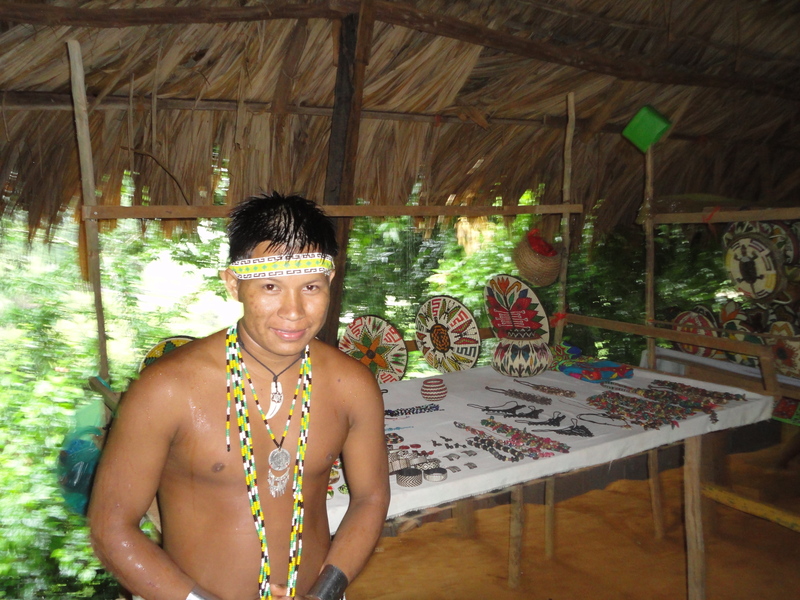 These five groups represent the five different indigenous groups that still remain inPanama today. Each group is organized intocomarcas ind?genas, orindigenous territories that are spread across the entire country. On July 26, we had the privilege of traveling to the Chagres National Park, also known as the home of the Embara. The journey began with a long bus ride from our hotel through the city and community of Chilibre to the entrance of the Chagres national park. Once we entered into the park, we quicklyarrived at the location of the canoes and indigenous guides waiting to take us into the park where the Embara live. We got into the canoes and travelled up the river for a while to the location of a waterfall tucked away in the jungle. It was only a short hike to the waterfall where we were able to get into the water and cool off from the hike. After the waterfall, we hiked back, got into the canoes once again and journeyed to the homes of the Emabara community that would be hosting us for the afternoon. We received a welcome reception and were soon in the meeting room of one of the groups of families. The community is organized by groups of families that each shares a kitchen and sitting area. Once in the kitchen several of us were recruited to perform different tasks to help the women prepare a meal for us, I was recruited to cut the melon and pineapple. We enjoyed a meal of fried fish, plantains and fresh fruit; this was oneof the best meals that I had while in Panama. During the meal we also had the opportunity to speak the leader of one of the families and ask him questions about his lifestyle and health beliefs and practices. To end our visit, we journeyed to a main area that housed all of the crafts made by the various families. In addition to the display of crafts, we enjoyed traditional music and dances of the Embara. 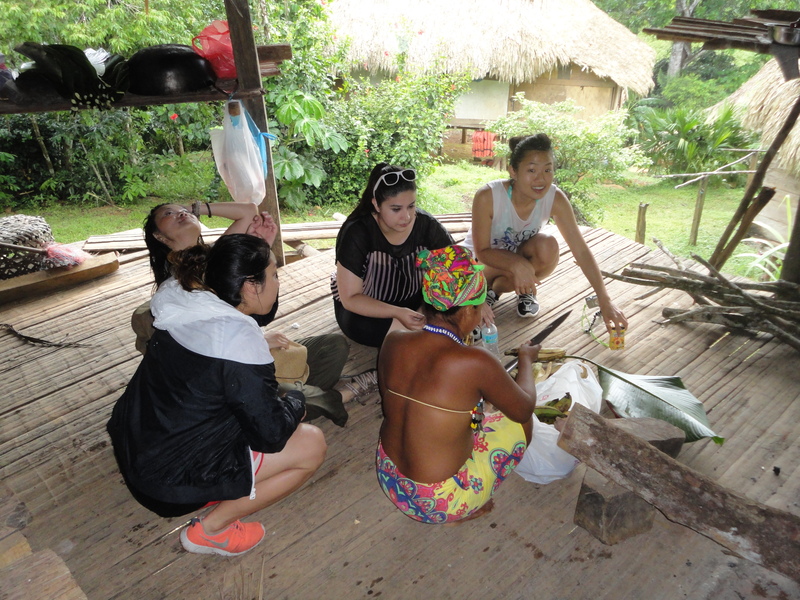 Visiting the Embara and being welcomed into their community was an incredible experience. It is amazing to see how well they have beenable to preserve their culture, beliefs and practices for such a long time. Their spirit, pride and strength of family are the things I will remember most and hope to remember in the future. Learning a little about their health beliefs and practices were very interesting as well. While they do prefer traditional medicine, they recognize and understand that they can access modern medicine in serious cases of illness or disease, and they do. This was verified on our tour of the children’s hospital where we saw families from several of the different indigenous communities receiving medical care. Our trip deep into the Chagres National Park to the home of the Embara was one of my most memorable experiences of my time in Panama and I hope to remember that journey always. The USC Institute for Global Health aims to improve global health by educating future and current global health leaders, carrying out trans-disciplinary research, and assuring that the evidence collected informs policy and practice to make a difference. Learn more about our student fellowships, travel opportunities and research at http://globalhealth.usc.edu. Are you a USC student embarking on a global health adventure? Apply to become a guest blogger for the USC Global Health Travel Blog! Simply fill out this form so we can learn a little more about you and your project. M-F 9:30 a.m - 5:30 p.m.